B.B. Whitehouse & Co. were about to re-erect the instrument, which was in store at the Strand, when at the last moment it was decided not to proceed with the installation, and the theatre owners sold the organ to the Roman Catholic Church. What prompted this decision is not known, but it is possible that word had travelled around the cinema industry that church-type instruments were not really suitable for silent film accompaniment, and that the instrument of the future for that purpose was the unit theatre organ. The instrument was removed from the theatre and erected by Whitehouse in St. Stephen's R.C. 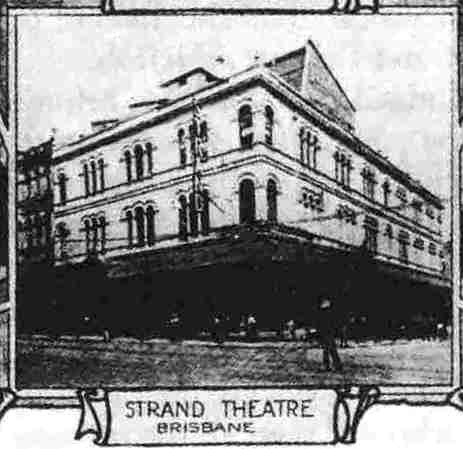 Cathedral, Brisbane, in 1922, with two additional stops. It was further enlarged in 1925 with one more pedal stop and an extra coupler, again by Whitehouse, and then remained unaltered until shipped south to Melbourne in 1983 for rebuilding. It was reinstalled in the cathedral, but its life there was short, as the cathedral was remodelled in the late 1980s, and the organ was rescued at the last moment and removed to store at the old Exhibition Building at the intersection of Gregory Terrace, Brunswick Street and Bowen Bridge Road. The instrument is now owned by the Queensland Department of Administrative Services. The Strand has long since been demolished, and shops now occupy its site. By happy coincidence, one of the shops is named "Strandbags", part of a retail chain and not in honour of the former theatre.